Natural Forests Could Store 40 Times More Carbon Than Tree Farm "Forests"
MLK's Poor People's Campaign in 2018: 50 Years Forward. MLK Shook the Empire to Its Core 50 Years Ago Today! by Eileen Crist & John Butler. James Hansen Youtube. Most Shocking Climate Report to Date. EO Wilson: "Set Aside 50% of Earth for Wildlife"
Will We Enact the Dream of '68? Will National Forests Be Sacrificed for Biomass Energy? EO Wilson Proposes"50% of Biosphere Placed In Reserves to Halt Biological Holocaust"
Could Methane Blast Biosphere Into Instant Climate Emergency? 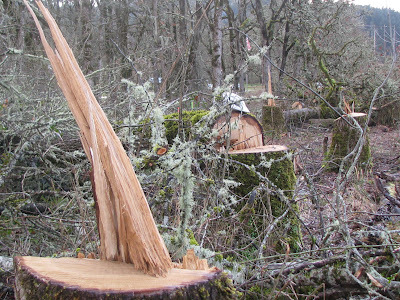 SW Oregon Mill Threatens Closure to Garner BLM Old Growth? Over the last few years Eco Advocates has noticed major expenditures and development happening inside publicly owned lands managed by Lane County and Willamalane Parks Departments. Perhaps this sort of boondoggle expenditure for luxury recreation facilities is happening all over Oregon, the West and the entire country? The $1+ Million Dollar Per Mile Luxury Dog Walker's Path to No-Where in Southern most Springfield! The largest and most expensive project in Lane County currently is the 4 mile $6.5 million new multi-use "path" connecting Clearwater Park and Dorris Ranch Park in south Springfield. This path is wide enough to drive any size vehicle upon. Some parts of the "path" has literally been bulldozed on the banks of the Willamette River. Many acres of riparian area within 10, 20 and 30 feet of the river has been destroyed or degraded to accommodate this new luxury dog walkers path. A half dozen 150 year old Oregon White Oak trees where cut down (see some of them below) for a new parking lot for the path. That reminds us of a Joni Mitchel song chorus "We paved Paradise to Put Up A Parking Lot". In this case we are paving paradise to put up not just a parking lot but a 12 foot wide concrete road, err... I mean "path". To finish the path Willamalane has laid stakes to bulldoze about a quarter mile of meadow (see picture below) instead of using existing roads inside Dorris Ranch. It all seems like a great way to make big profits for the local paving and gravel quarry companies at the expense of the environment, wildlife, and tax payer. We first discovered the "path" construction, more like a road, in late 2012. After walking the path construction site just east of Dorris Ranch we discovered a whole cut-bank eroding into the river and wetland area. We and Oregon Clean Water Action Project subsequently contacted the City of Springfield to urge them to fix this woefully inadequate erosion remediation of the unfinished "path". They and ODOT responded and contacted the contractors to take additional measures to fix the problem. Upon attempting to visit the site again ODOT or Willamalane apparently decided that they needed to keep citizens out of the construction site with more than a half mile of new fence at Tax payer expense. They Paved Paradise (wetlands and 150 year old Oregon White Oaks) to Put Up a Parking Lot and a Very Expensive bathroom with all the amenities. Wreckreation Development is also occurring in the very popular Mt. Pisgah or Buford Park. Some years ago a new policy was created to allow benches to serve as memorials to people who have recently passed away as some sort of fundraiser. These memorials are apparently allowed to be placed all over the Buford Park. For many hundreds of dollars you could have a loved one or perhaps even ones pet be memorialized in the park by new benches and brass name tag. Perhaps if this was just allowed in the arboretum area and reserved for people who had done some great service for the community or for Buford Park that might be acceptable. However, these "bench memorials" only requirement seems to be "one must have enough cash to pay for the bench and installation," which we surmise must be around $1000 or more. Now, upon a recent visit to the top of Mt. Pisgah two new bench "memorials" have been installed where they were never before at the very top of Mt Pisgah. Is it not customary to have cemeteries serve this purpose not publicly owned parks? Concert and Rave Center Being Built on North Side of Buford Park? On another visit I plan on investigating the northern side of Buford Park. I have been told that Lane County Parks is planning to develop and expand an area to accommodate large public gatherings such as outdoor concerts or other commercial ventures again to raise money for Lane County Parks. I was told that a "Faerie World" rave party was held there in the recent past. So we suppose that Lane County has this vision of accommodating even larger "events" of all kinds in this part of Buford Park. Now, how does that benefit wildlife or low impact recreation? We believe this is a form of privatizing public parks through development and thus is unacceptable. This form of development that only benefits a few, namely the construction contractors and the Park's hierarchy should be investigated and stopped. We will add more pictures as soon as we can stomach going back to see what was destroyed.